Dave Rapoza is a self-taught illustrator from Boston, MA, and freelancer since 2006. According to his website, he studied Andrew Loomis's and Bridgman’s figure drawing books and practiced by making numerous drawings from direct observation, often of items from on desk. In an article on MovingSketch.com, he said he is self-taught as an illustrator because he did not have funding for classes or materials. He bought a tablet and studied all he could fine about Photoshop. He continues to use Photoshop as his primary tool for his work. In order to stay motivated, he formed the Crimson Daggers, a daily livestream where illustrators would study and talk as a group. Crimson Daggers is a free online community/study group focused on improving all around fundamental skills, especially in the areas of Illustration and Concept art. Currently Crimson Daggers is co-hosted by Dan Warren on his Livestream /, and Dave Rapoza and Dan Warren lead an open forum discussion on anything relating to current goals in art. At the end of each Livestream, Dan and Dave do two live critiques of work linked in the chat, discussing composition, form, and lighting. These critiques last anywhere from 15-30 minutes and are posted in the Livestream library for later viewing. Dave Rapoza has many illustration credits for such publishers as Wizards of the Coast, Paizo Publishing, and Privateer Press. His first cover illustration in the Pathfinder line was that for Neil Spicer's Realm of the Fellnight Queen in 2010. 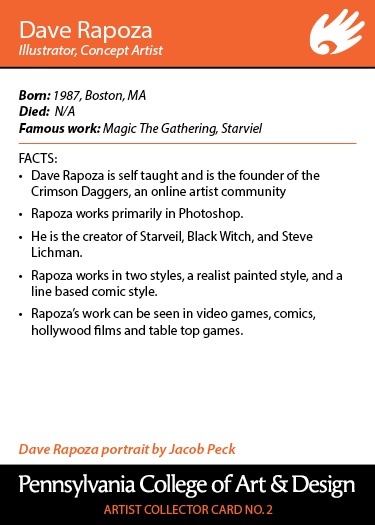 Some of his works include StarVeil, Skull & Shark, Black Witch, and Steve Lichman. 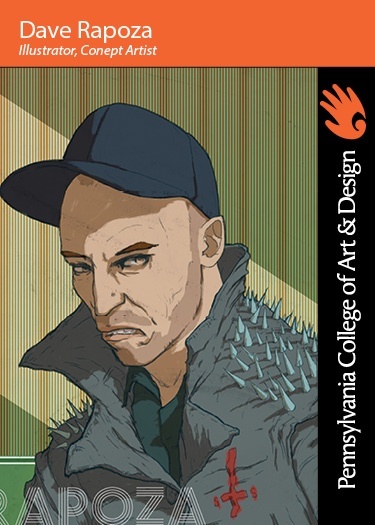 He illustrates for clients such as Bethesda, Hasbro, Blizzard, Universal, Lionsgate, MTV, and Riot Games. Each week on the Pennsylvania College of Art & Design blog, a different profile of an artist is posted. These are taken from a classroom project where the illustration and fine art students create “Artist Trading Cards,” first researching the facts about and the style of a selected artist, then making a trading card that captures the spirit of the artist.